Thai Silks - Artist's Items » Ties » Tie 3 1/4" White, "Optical" Jacquard. 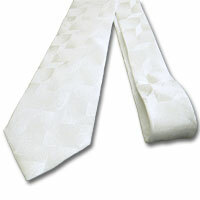 Product: Tie 3 1/4" White, "Optical" Jacquard. Type: 100% Silk/Poly Filler. Polyester Filler Natural. Necties must be dyed or painted with a product that does not require steaming or immersion in liquid.